Data on the existence of risk factors for hearing impairment will have significant clinical relevance because they can offer important information for both the family and health-care providers about etiology, other associated health problems, and risk of recurrence in a subsequent pregnancy. Family history and consanguinity indicates the possible involvement of genetic etiology. Consanguinity is a term derived from two Latin words "con0" meaning common or of the same and "sanguineus" meaning blood. It is a marriage relationship between two close relatives. At present, about 20% of world populations live in communities with a preference for consanguineous marriage,  which includes South India. Apart from consanguinity, family history of childhood hearing impairment can directly influence the occurrence of hearing impairment. This particular history can guide diagnosis and evaluate the need for additional diagnostic tests. The first information collected for the genetic testing is always the family history. It also helps in knowing the pattern of inheritance of hearing impairment. The existence of consanguinity increases the importance of family history showing clear pattern of inheritance of hearing loss. There are several studies in the western literature to associate the family history with hearing impairment. In general, it is considered as low prevalent risk factor. ,, In India, it is important to know the strength of association of family history and consanguinity with hearing impairment in India. This data will be helpful in planning national programs like "Prevention of deafness." Moreover, in a place like south India where consanguinity is very high, there is scarcity of the literature. The aim of this study was to find the strength of association of family history and consanguinity with permanent hearing impairment in infants. A case-control study was designed on 420 infants (6 month to 2 years) with permanent hearing impairment and normal hearing from 2008 to 2012. The cases were infants with permanent hearing impairment and controls were normal hearing infants. Infants with sensorineural hearing loss were considered as permanent hearing impairment. The case-control ratio was 1:1. Sample size was determined based on the prevalence of risk factors as per Vohr et al. for the power of 80%. Alternate sampling method was used in a hospital for selecting the control group. Infants with hearing impairment were selected from four hospitals in Chennai city of Tamil Nadu state, India. Exclusion criteria were history of middle ear discharge, gross developmental delay, and Infants with less than 1500 g of birth weight. Instititional Ethics Committee of Sri Ramachandra University has given approval for the study. Along with the parental opinion about the hearing status, Auditory Brainstem Response screening using Beraphone MB11 (It is the model name and doesn't need expansion) was carried out for all the controls to rule out the hearing impairment. Diagnostic ABR instruments such as Grason Stadlor Incorporation-Audera and Intelligent Hearing System-Junior instruments were used to confirm the sensori neural loss in hearing impairment group. Parent interview was carried out to collect the information of family history of childhood hearing impairment and consanguineous marriage for both the control and hearing impairment group. Statistical analysis of odds ratio, Chi square test, 95% confidence interval (CI) and spearman correlation was applied to the data. 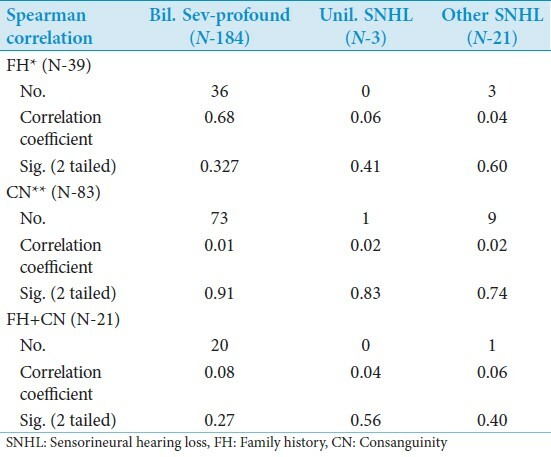 As shown in [Figure 1], family history of childhood hearing impairment and consanguinity were higher in the Hearing Impairment group compared to the control group with high statistical significance ( P = 0.000). The combination of risk-factors were also significantly higher in the HI group (P = 0.000). As the [Table 1] indicates, the risk estimate for family history and Consanguinity was 6.5 and 3.7 with narrow CI showing the good precision of the findings. When both the risk-factors are combined together, the risk estimate is very high. The CI is very large due to less number of this factor in the control group. There was only one family in the control group for the combined risk factor. When the risk factors were correlated with different types of sensori neural hearing impairment [Table 2], none were statistically significant. Family history was having moderate correlation with bilateral severe to profound hearing impairment. Almost 100% of infants with the combination of family history and consanguinity had severe - profound impairment. 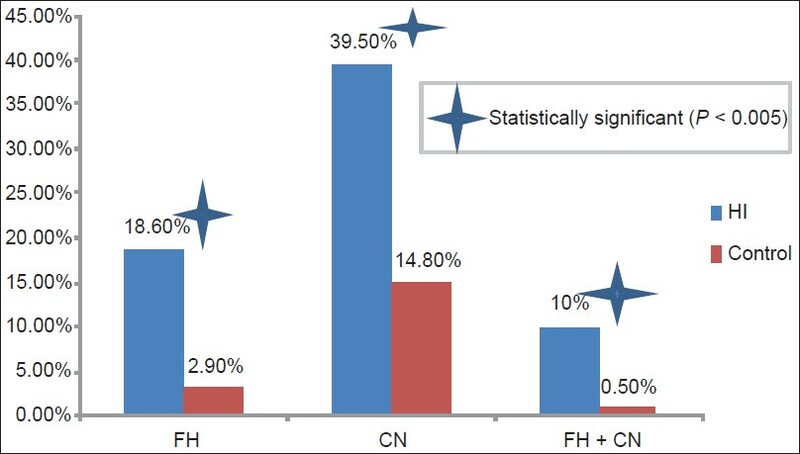 [Figure 2] shows the percentage of second and third degree consanguinity in HI and control group. Both the factors are significantly higher in the hearing impairment group (P = 0.000). [Table 1] shows that risk estimate is slightly different for second and third degree consanguinity with former having a higher risk. Both of it is having narrow CI showing the high precision of the finding. Second degree and third degree consanguinity can cause 25% and 12.5% chances of gene sharing in the off-spring. Therefore, there are proportionate chances of incidence of hearing impairment in the family. This is the reason why risk estimate of 2 nd and 3 rd degree consanguinity slightly vary in the present study [Table 1]. A difference in the gene sharing had a direct influence in the association of consanguinity with hearing impairment. It was noticed that the prevalence of consanguinity in the total population of the present study is slightly less than what is reported earlier. Earlier literature shows there is 30-50% of consanguinity in south India. In the present study, 28% had consanguineous marriage. This is in the lower limit of earlier prevalence literature. Family history of childhood hearing impairment is another crucial risk factor, which is closely linked with consanguinity among the genetic cause of hearing impairment. There are many studies in India showing the prevalence of family history in children with hearing impairment. A school based study in Mumbai  found family history as a statistically significant risk factor for hearing impairment. Nearly, 30% of children with hearing impairment were having this risk factor, causing the highest association among the risk factors such as prematurity, low birth weight, infections etc., The risk estimate, when extracted appears to be 67. A study in Karnataka,  found 25% of babies with hearing impairment were having a family history. In Kerala,  38% of children with hearing impairment were having a family history. These data are highlighting the need of creating awareness on a preventable cause of hearing impairment in India. The risk factors are not having correlation with different types of permanent hearing impairment statistically. In terms of percentage, more than 90% of Family History and Family History with Consanguinity category [Table 2] were having bilateral severe-profound hearing loss. In Netherland,  39% of permanent hearing loss is attributed to hereditary reasons in which 49% were having severe and profound hearing impairment. The effect of hereditary reasons on permanent hearing impairment seems to differ with the population. Family history and consanguinity are strongly associated with congenital permanent hearing impairment. A child with family history has six times more chances of having permanent hearing impairment. Family history is still continuing to be an important risk factor as in the past in the southern part of India. A child with consanguineous parents has three times more chances for developing permanent hearing impairment. The second degree consanguinity is having three times chances, and third degree is having two times chances of occurrence of hearing impairment. 1. Vohr BR, Widen JE, Cone-Wesson B, Sininger YS, Gorga MP, Folsom RC, et al. Identification of neonatal hearing impairment: Characteristics of infants in the neonatal intensive care unit and well-baby nursery. Ear Hear 2000;21:373-82. 2. Modell B, Darr A. Science and society: Genetic counselling and customary consanguineous marriage. Nat Rev Genet 2002;3:225-9. 3. Smith RG, Vancamp G. Deafness and hereditory hearing loss. Gene reviews. 2007. Available from: http://www.cridi.com.br/testedesurdez1.pdf. [Last accessed on 2012 Dec 14]. 4. Tadmouri GO, Nair P, Obeid T, Al Ali MT, Al Khaja N, Hamamy HA. Consanguinity and reproductive health among Arabs. Reprod Health 2009;6:17. 5. Verma IC. Burden of genetic disorders in India. Indian J Pediatr 2000;67:893-8. 6. Kingston HM. ABC of Clinical Genetics (ABC Series). 3 rd ed. London: Wiley-Blackwell; 2002. p. 120. 7. Cone-Wesson B, Vohr BR, Sininger YS, Widen JE, Folsom RC, Gorga MP, et al. Identification of neonatal hearing impairment: Infants with hearing loss. Ear Hear 2000;21:488-507. 8. Van Riper LA, Kileny PR. ABR hearing screening for high-risk infants. Am J Otol 1999;20:516-21. 9. Hall JW. Handbook of auditory evoked responses. 3 rd ed. All. Boston: Allyn and Bacon; 2007. 10. Zakzouk S. Consanguinity and hearing impairment in developing countries: A custom to be discouraged. J Laryngol Otol 2002;116:811-6. 11. Khabori MA, Patton MA. Consanguinity and deafness in Omani children. Int J Audiol 2008;47:30-3. 12. Amini SR, Kamali M. Consanguineous marriage among the parents of hearing impaired students in mashhad. Iran Rehabil J 2010;8:36-9. 13. Suresh M. Prenatal and postnatal conditions shared by children born hard of hearing and enrolled in an early intervention programme in Tamilnadu, India. Unpublished PhD thesis: Madras University, Chennai; 2008. 14. Coltman DW, Pilkington JG, Smith JA, Pemberton JM. Parasite-mediated selection against inbred soay sheep in a free-living, island population. Evolution 1999;53:1259-67. 15. Lyons EJ, Frodsham AJ, Zhang L, Hill AV, Amos W. Consanguinity and susceptibility to infectious diseases in humans. Biol Lett 2009;5:574-6. 16. Lakshmanaswamy Aruchamy. Clinical Pediatrics. New Delhi: Wolters Kluwer; 2010. Available from: http://www.lwwindia.co.in/book/9788184732221/clinical-pediatrics.aspx. [Last accessed on 2012 Nov 17]. 17. Bittles AH. The Global prevalence of consanguinity. 2009. Available from: http://www.consang.net/index.php/Global_prevalence. [Last accessed on 2012 Dec 7]. 18. D'Mello J. High risk register: An economical tool for early identification of hearing loss. Indian J Pediatr 1995;62:731-5. 19. Nagapoornima P, Ramesh A, Srilakshmi, Rao S, Patricia PL, Gore M, et al. Universal hearing screening. Indian J Pediatr 2007;74:545-9. 20. Joseph AY, Rasool TJ. 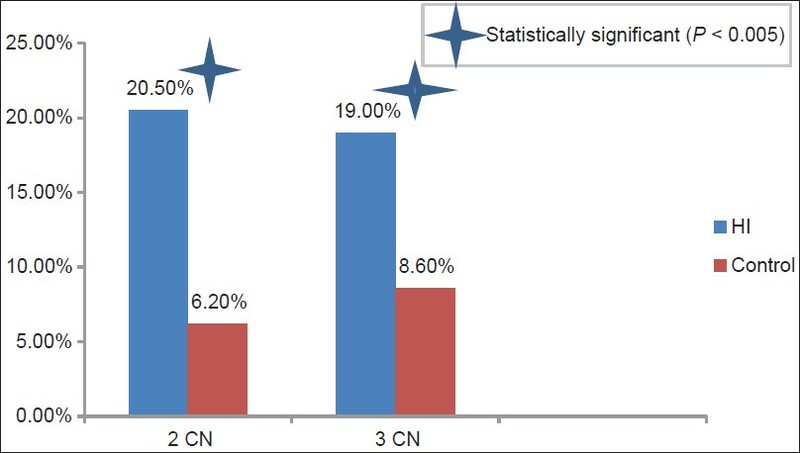 High frequency of connex in 26 (GJB2) mutations associated with nonsyndromic hearing loss in the population of Kerala, India. Int J Pediatr Otorhinolaryngol 2009;73:437-43. 21. Korver AM, Admiraal RJ, Kant SG, Dekker FW, Wever CC, Kunst HP, et al. Causes of permanent childhood hearing impairment. Laryngoscope 2011;121:409-16.